Leprosy is a chronic infection by Mycobacterium leprae and causes body-wide symptoms, deformities, and disability. It remains a public health problem worldwide, despite the existence of antibiotic combinations that can cure it. Hemostatic disorders are frequently associated with acute and chronic infections due to the fact that platelet functions, blood coagulation and fibrinolysis are intimately correlated with the immune system. For years, doctors have observed that some patients with leprosy develop unusual blood clots, which can lead to stroke or heart attack. 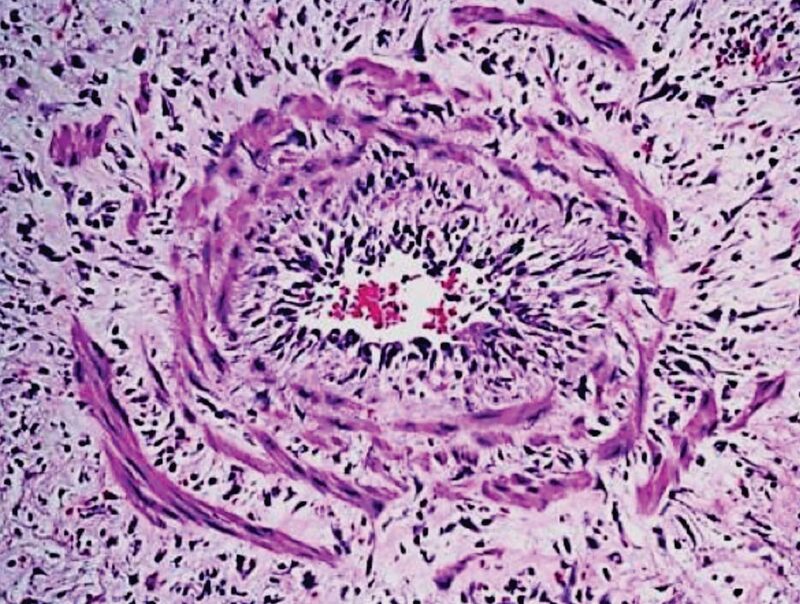 Image: A histopathology of a deep vein inflammatory infiltrate with wall dissociated by edema, observed in a skin lesion of a leprosy patient suffering an erythema nodosum leprosum episode (Photo courtesy of Oswaldo Cruz Institute). Scientists at the Oswaldo Cruz Institute (Rio de Janeiro, Brazil) analyzed two groups of patients: a prospective group, which plasma samples were collected before multidrug therapy against leprosy, composed of 11 non-reactional (multibacillary leprosy; MB-NR), being 10 lepromatous leprosy (LL) and one borderline lepromatous (BL). The erythema nodosum leprosum patients group (MB-ENL) included 13 LL and one BL individuals. These two groups include six females, 19 males with median age of 45.2 years, ranging from 23 to 80. The retrospective cohort was composed of 638 leprosy outpatients at an Outpatient Unit, from 2012 to 2014, where 35 patients presented the leprosum clot during serum harvesting. The team performed SDS-PAGE and protein content was measured with the commercially available 2D Quant-Kit. Spots were taken from the gel, digested with trypsin and analyzed by spectrometry using the MALDI-TOF/TOF 5800. The mass spectrometry protein identifications were obtained with a 5800 Proteomics Analyzer. The scientists applied the STA-R Evolution instrument to determine partial thromboplastin time (aPPT) and prothrombin time (PT) in all plasma samples. The levels of von Willebrand and soluble tissue factor, C4 complement, and anti-cardiolipin IgM antibody in the serum of leprosy patients were determined using the following commercial kits: Human von Willebrand Factor ELISA kit and Human Tissue Factor ELISA kit and C4 turbiquest, respectively. The team found that patients both experiencing a reactional episode and those with non-reactional leprosy had factors in their blood, including plasmatic fibrinogen, anti-cardiolipin antibodies, von Willebrand factor, and soluble tissue factor, promoting blood coagulation. Formation of leprosum clots, they showed, was correlated with increased levels of soluble tissue factor and von Willebrand factor. Tests on leprosum clots revealed high contents of lipids and fibrinogen, and showed higher levels of two proteins, complement component 3 and 4 and inter-alpha- trypsin inhibitor family heavy chain-related protein (IHRP), compared to clots from patients without leprosy. The authors propose that multibacillary patients with high levels of fibrinogen could be beneficiated from a prophylactic use of xanthine derivatives such as pentoxifylline, in order to prevent some of the acute clinical symptoms observed during severe cases of leprosy reactional episodes, such as cyanosis and tissue necrosis, probably related with superficial vein thrombosis. The study was published on March 22, 2018, in the journal PLOS Neglected Tropical Diseases.